Blackberry plant varieties come in two main types: erect and trailing. Winter care for the two types differs slightly. Erect blackberry plants are more cold-hardy than trailing ones, and require less care. Trailing types will need to be pruned and then tucked in for the winter. Erect types will merely need to be pruned. If your winters are mild (do not get below freezing), you will not need to do anything except prune for either type of blackberry. Identify which type of canes are currently growing on your blackberry: primocanes or floricanes. Think about whether you harvested blackberries this year or not; blackberries only come from floricanes. Prune the primocanes of erect varieties of blackberry during the later winter months in your area. Choose the three or four strongest canes of each plant, and get rid of the rest using your pruning shears. Prune back any trailing branches on these canes to between 12 and 18 inches in length. Stake the branches of erect varieties and train them to the stakes. Tie them to the stakes with twine so that the branches point upward. Prune the primocanes of trailing varieties of blackberry during the early winter months in your area. Use the same rules as for erect varieties. Apply a thick layer of mulch to the canes of trailing blackberry varieties. Use at least 3 to 4 inches of mulch to provide ample insulation against extreme winter weather. Blackberries produce fruit biennially, on floricanes. Primocanes are the canes that grow during nonfruit-producing seasons. Floricanes should be pruned immediately after harvesting blackberries. This improves disease resistance, since floricanes only produce one batch of fruit before becoming inviable. Trailing blackberries may be staked and trained as well, if you prefer. Stake them in the spring, after all danger of frost has passed. If you live in a warm climate with mild (not freezing) winters, you may choose to stake them prior to winter. Trailing varieties are more susceptible to cold than erect ones, so be careful. If growing erect blackberries in a hedge, you might consider using a trellis to train them. Pounding stakes into the ground every few feet and stringing wire between them can create a nearly invisible trellis for your blackberries. Choose any wire that is strong, weather-resistant, and aesthetically pleasing. Manure is sometimes applied as an optional fertilizer for blackberry plants. If you choose to use manure, do not apply it until early winter. 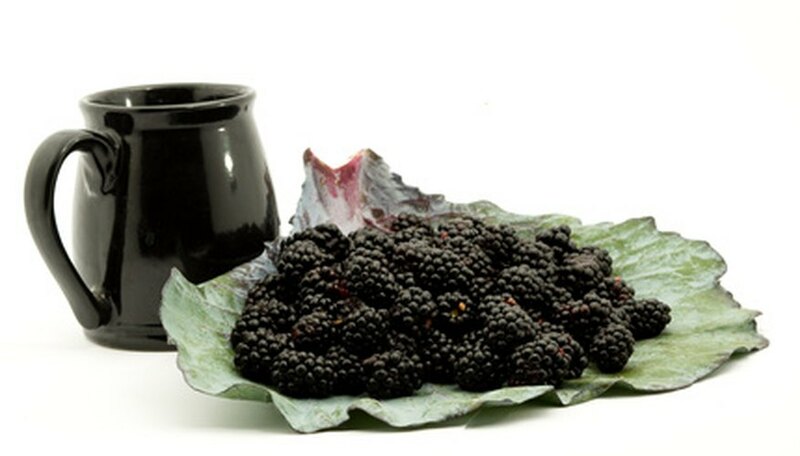 The Oregon State University Extension advises that if you apply it earlier, your blackberry plants may use this sudden flush of nutrients to produce late-season blackberries. Production of late-season blackberries increases the risk of winter injury to your blackberry plants.